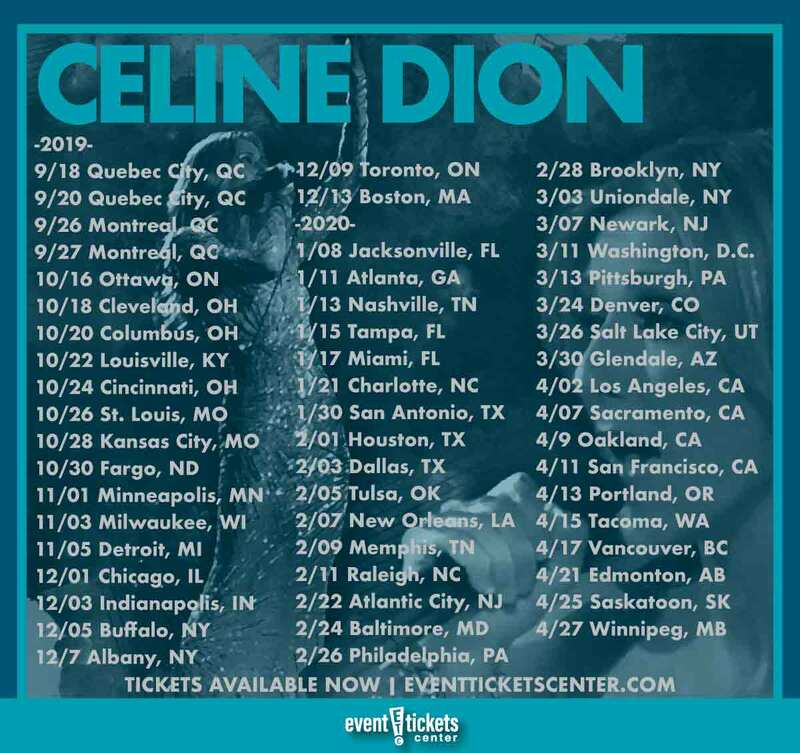 Celine Dion will be hitting the stage in cities across the US for the first time in over 10 years on her newly announced “Courage World Tour.” The massive 55-city North American trek launches this fall and will run through spring of 2020. “Courage World Tour” gets underway September 18 in Dion’s home province of Quebec, with her first US show set to take place one month later in Cleveland, OH on October 18. The singer will hit the stage in over 40 cities stateside, including Chicago, Boston, Miami, Dallas, Washington, DC, and Los Angeles, closing out her US run in Tacoma, WA on April 15, 2020. She will then head back north of the border for the remainder of the North American leg, which wraps up April 27 in Winnipeg, MB. Celine announced the exciting news - as well as plans for a new album of the same name - during a special live event in LA on Wednesday, April 3. The singer answered fans’ burning questions on what to expect from the album and upcoming run of shows during a Q&A with the audience. And as for the name of her upcoming album, Celine had some thoughtful insight to share. “Courage World Tour” will be Celine’s second world tour since the launch of her Las Vegas residency at the Colosseum at Caesar’s Palace in 2002. The five-time Grammy winner holds the Billboard Boxscore record for highest-grossing residency of all time. “I’m so grateful to all the fans who have come to see my show in Las Vegas for so many years, and now I get the chance to create a brand-new show and bring it to them in North America, and around the world,” she shared in a statement. Courage marks Celine’s 12th English-language studio album and is due for release later this year. Powerhouse vocalist Celine Dion emerged as a teen star in her homeland of Quebec, Canada with a series of French-language albums in the 1980s. After learning to speak English, she was signed to Epic Records in the US and released her debut English-language album Unison in 1990, earning praise from music critics and establishing herself as a force to be reckoned with in North America as well as other English-speaking territories across the globe. Dion skyrocketed to international superstardom in the 1990s, becoming a multi-platinum, Grammy-winning crossover artist who dominated the charts with her unrivaled vocals and heartfelt ballads on albums like Falling into You (1996) and Let’s Talk About Love (1997), both of which earned diamond certifications in the US. The singer scored a series of international number-one hits as well, including “The Power of Love,” “Because You Loved Me,” “It’s All Coming Back to Me Now,” and “My Heart Will Go On,” the latter of which served as the main theme to James Cameron’s box office smash Titanic in 1997. “My Heart Will Go On” is one of the best-selling singles of all time and is considered the singer’s signature song. Dion continued to release French albums between each English record, including 1995’s D'eux which became the best-selling French-language album of all time. Dion is considered one of the most influential artists in popular music. Her award-winning contributions to major film soundtracks helped expand her reach far beyond the realms of the Adult Contemporary genre, resonating with audiences of all backgrounds and ages. Dion has earned five Grammy Awards, including Album of the Year and Record of the Year. She remains the best-selling Canadian artist and one of the best-selling artists of all time with record sales of over 200 million copies worldwide. Where is Celine Dion playing near me?